Just a reminder that Scotia B&B is dog friendly accommodation in Perth. We know ourselves how difficult it can be sometimes to find accommodation who will welcome dogs. 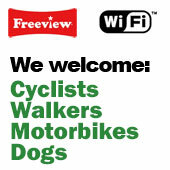 We are always more than happy to welcome well behaved dogs (and their owners!!!) to our Bed and Breakfast and usually have a little treat for them. So if you are looking for a dog friendly guest house in Perth, please give us a call or book directly on our secure web site.